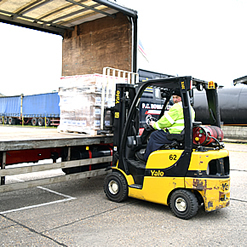 Palletways offers a five separate products to meet the needs of our customers and to provide comprehensive palletised freight solutions. We find that many consignees now want their goods booking in for a pre-agreed delivery time - this is something that your team can do but we also offer a free booking in service - we can take this additional burden off your hands. Affording the ability to pre-book your delivery means that your dispatch of your consignment can be arranged in advance and on a day and time to suit you. And at PC Howard Ltd we have systems in place to make this service a simple task.